I am sometimes reminded of the friendly nature of the people in Loch Ness and the Scottish Highlands, and indeed all of Scotland for that matter, at the most surprising times. Most recently was on an ill-fated trip to Glasgow. After stopping off at Fort William for some fuel in a borrowed car (not really borrowed but more of a temporary swap). The car cut out about 1/4 mile down the road…at a roundabout….during an increasingly busy spell of traffic……perfect……. It’s at these times you think along the lines of keeping calm and that it will all blow over. But I didn’t get the chance to do so. Within 30 seconds of the car drawing to a halt, a lovely lady whose name I didn’t catch had stopped her car on the opposite of the road to offer her help. While I was explaining what had happened, another car pulled up in front of me, and a man jumped out to also offer assistance. The next 10 seconds saw a breakdown truck pull in front of him and he also came to help. I really was pleasantly gobsmacked at the nature of these locals who saw a complete stranger in trouble and were prepared to go out of their way to lend a hand. As it happens, I had mis-fueled the borrowed car (I know a rookie error, right) so had to get the engine drained and never made it to Glasgow. But being offered and given some help from 3 local people, all who happened to chance by at that exact moment, makes me think how lucky we are in Scotland to have such a friendly and helpful nature not only as a country but as a people. It’s no wonder our reputations precede us on an international level. I had the pleasure of being introduced to Iain, another local chap of Fort Augustus. Iain runs Monster Activities providing plenty of activities for families and groups. 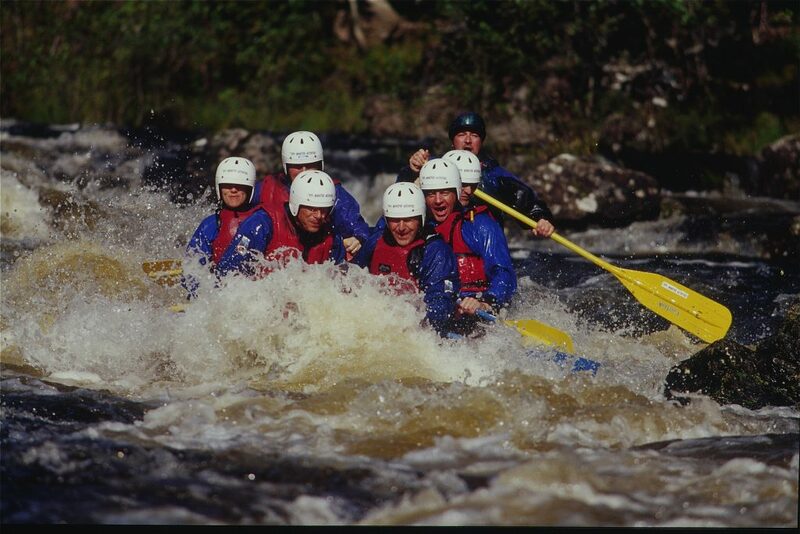 If you’re an adventurous sort, Iain will take you on a white water rafting tour or an abseiling session. Or if you enjoy calmer activities, why not try clay pigeon shooting, archery or even tomahawk and knife throwing. Or you can have a guided walk up Ben Nevis or around the Isle of Skye. One thing for certain is that you’re not short of choices! Click on the link to make contact directly with Iain and mention your holidaying at The Highland Club. He’ll do his best to make sure you have a Scottish holiday to remember. It’s been an incredibly busy month for us with no signs of it slowing down until after the summer months. A large group from Germany visited us for 7 nights in the middle of the month taking full advantage of Fort Augustus and The Highland Club. Our very own Bridget hosted the whisky tasting night in the Club Lounge. The middle of the week saw the group visit Skye and spend some time in the lovely local village of Fort Augustus. Their last night saw them dining at the Lock Inn, 3 minutes walk from The Highland Club with the night ending on a musical high with some Ceilidh music in the Atrium. We hope to see Werner next year with another group to experience the Scottish Highlands and the Highland Club. The last few days of June saw Pat Kane Musical Tours visiting also with a large group for 3 nights. Somehow, managing to squeeze in more than most, Pat and Kathleen arranged dinner and breakfast at the Boat House, a morning cruise around Loch Ness and a Ceilidh at the Boat House. Pat and Kathleen’s group arrived on the hottest day ever recorded in certain parts of Scotland, with temperatures exceeding 30 degrees celcius! An excellent climate for a walk along the nearby Caledonian Canal. Toothy the Abbey Cat enjoys the warm weather as much as the rest of us it seems. I’ve spotted him a few times wandering around outside, close to the Moat House. Occasionally, a rabbit will run in the opposite direction when Toothy the Abbey Cat approaches. 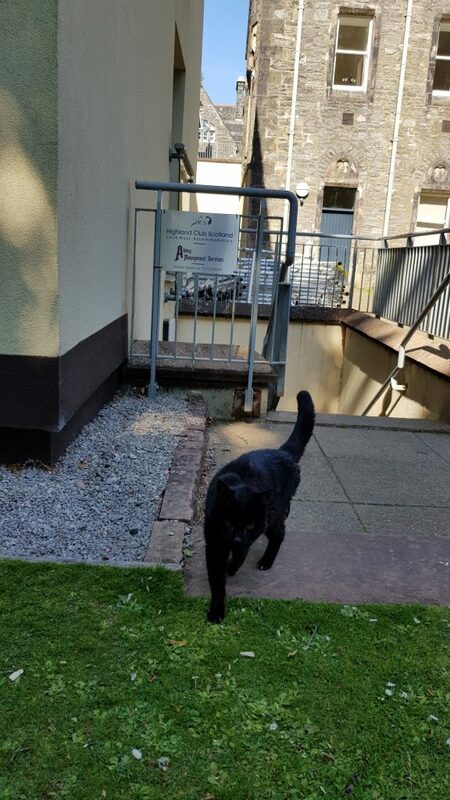 But we understand Tooth the Abbey Cat is far to busy relaxing and eating and sleeping and relaxing and eating and sleeping to be chasing the local wildlife around. I caught him outside the Abbey Management and Highland Club Scotland office today. It almost looks like he was stalking me but I took his approach as a form of gentle affection. 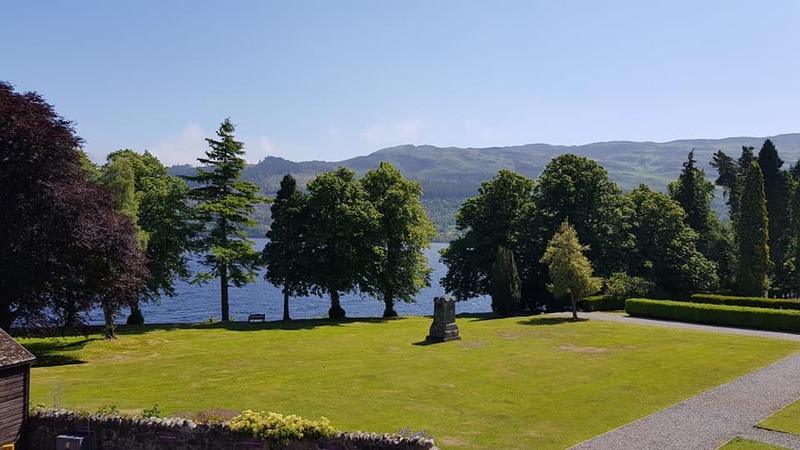 I was lucky enough to be helping the housekeeping staff on the hottest day of June in Loch Ness and took full advantage of some quick snaps with my phone while in some apartments. Some of you may have seen these already on our social media gateways, but nevertheless, I think they’re still worthwhile putting on the blog. Top of the Fort is very special with its private wraparound terrace. How nice it would be to sitting outside on that patio, eating breakfast in the sun with exceptional views from all around. On one side, you have the grounds of The Highland Club with the hills of the Great Glen Way in the background. To the other side, you look at the waves of Loch Ness itself. It really is a peaceful and gorgeous spot to be in. Boys Dormitory is another special and unique apartment. Mobile phone pictures simply do not do this amazing apartment any justice. You need to experience it for yourself. This picture was taken while sitting on the luxurious sofa in the living room. 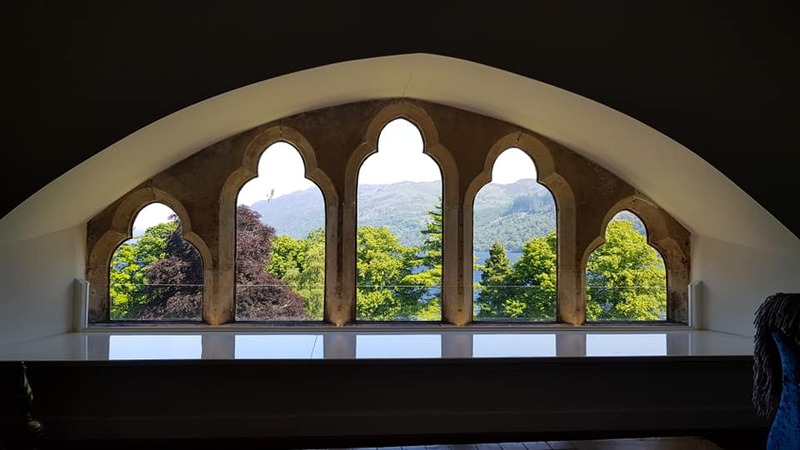 The arched windows looking onto Loch Ness and the Monastery Gardens have the added benefit of an adjustable uplighter making it even more attractive in the evening. I was lucky enough to be invited down for dinner and a Ceilidh at The Boat House by Pat and Kathleen Kane, who arrange holiday tours from America. The music was provided by live band Kilderkin and Pat instructed us all for the dancing in his own charismatic and charming way way. There are some videos on The Boat House Facebook page. I was clearly too busy having a good time to be taking pictures…. There has indeed been plenty of action at the Highland Club this month, but you must see it for yourself. We still have some availability and if you time it right you could benefit from our Special Offers. July is looking incredibly busy so I’ll expect to have a few more stories to tell in next month’s blog.